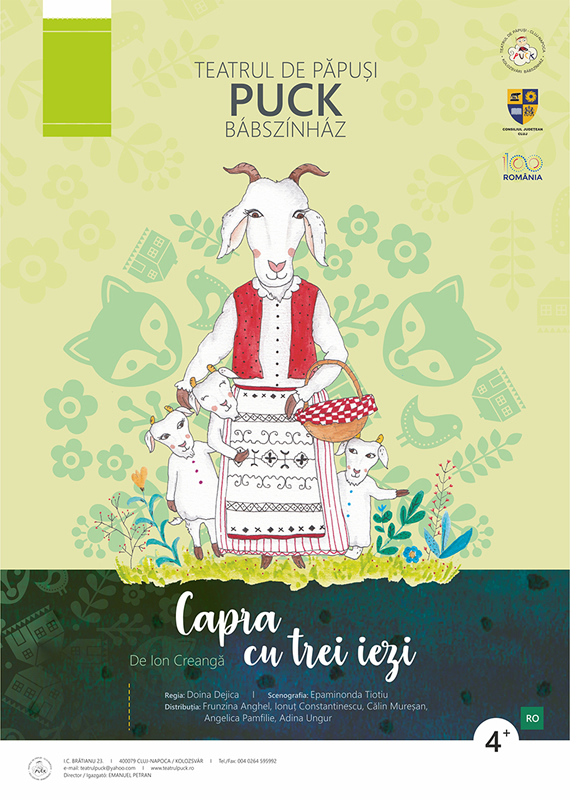 A beloved play of many generations, directed by Doina Dejica, is based on Ion Creangă’s well-known tale, The Goat and Her Three Kids. 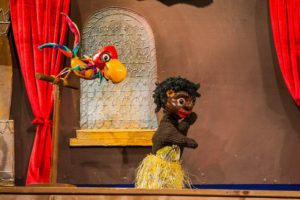 By maintaining the classic puppet show conventions, it is designed so that children can find and recognize all details of the popular tale. 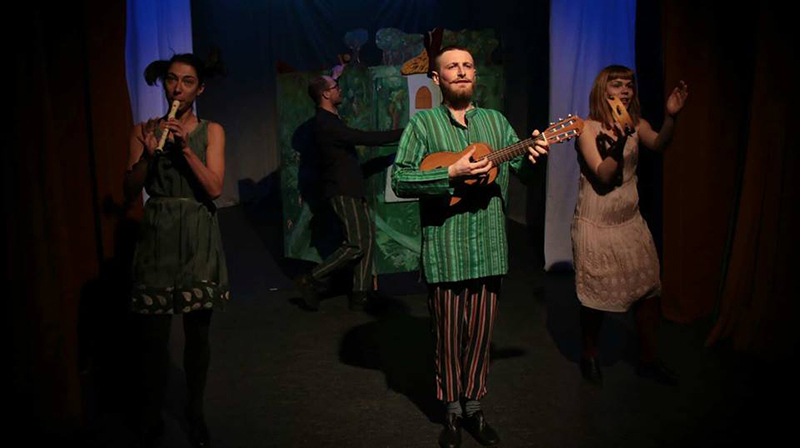 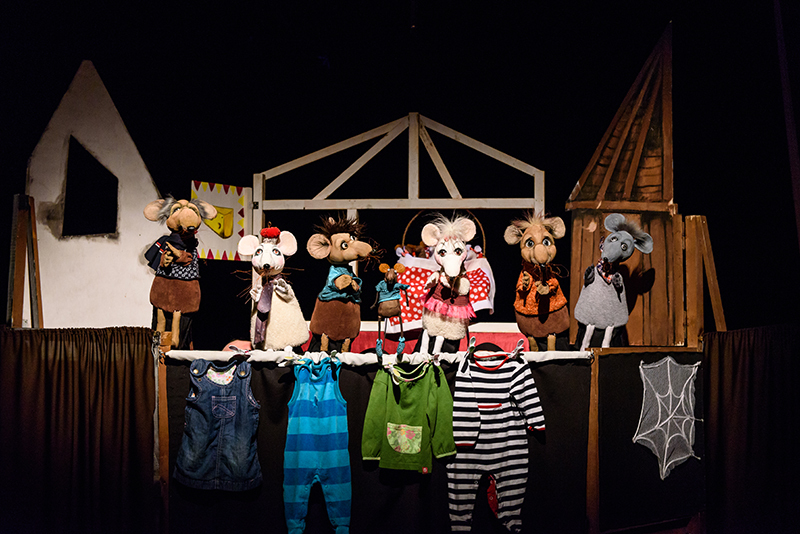 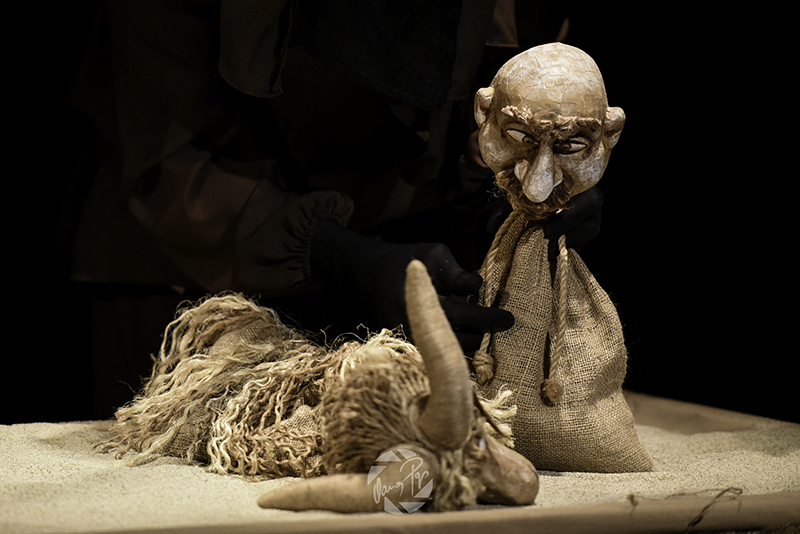 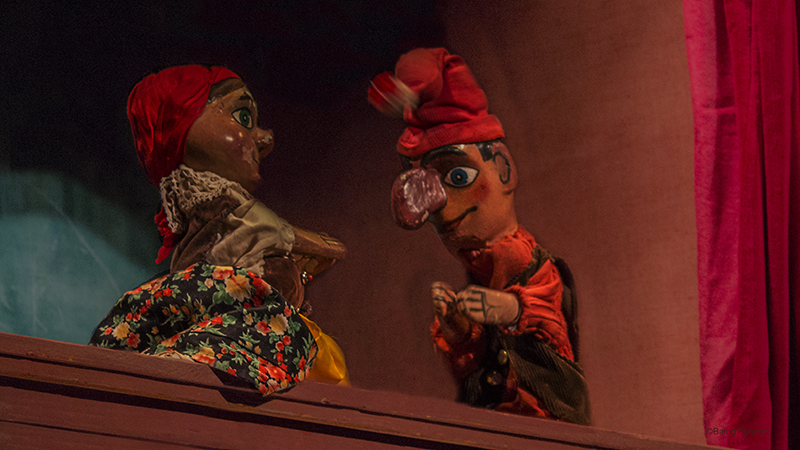 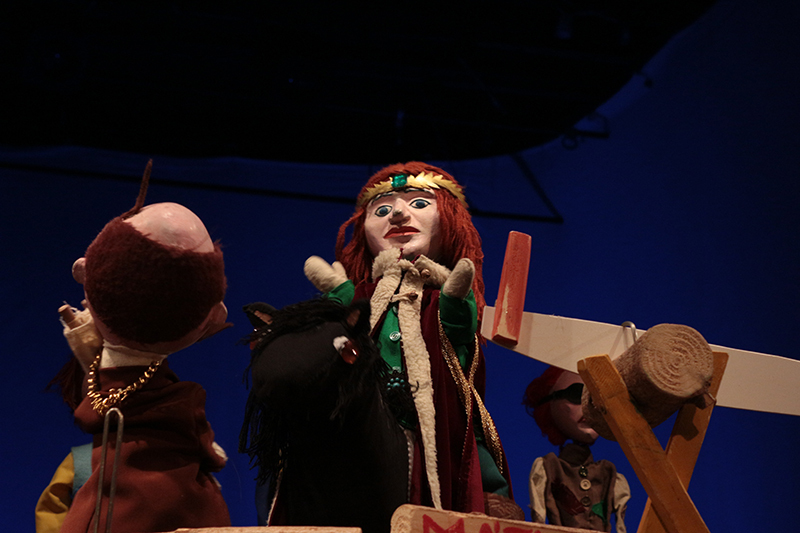 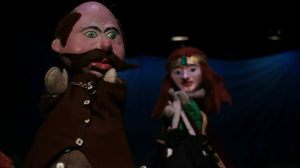 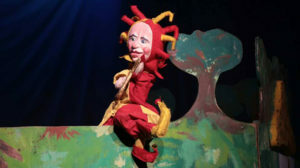 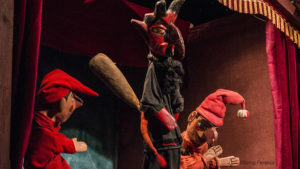 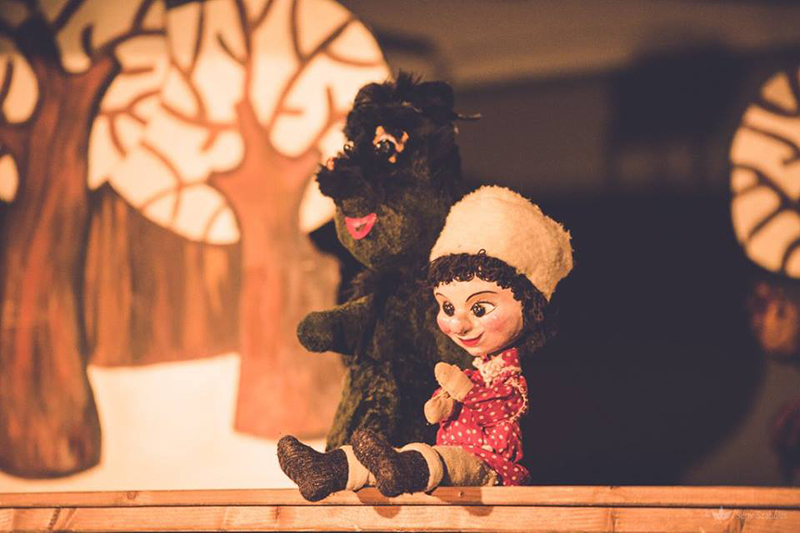 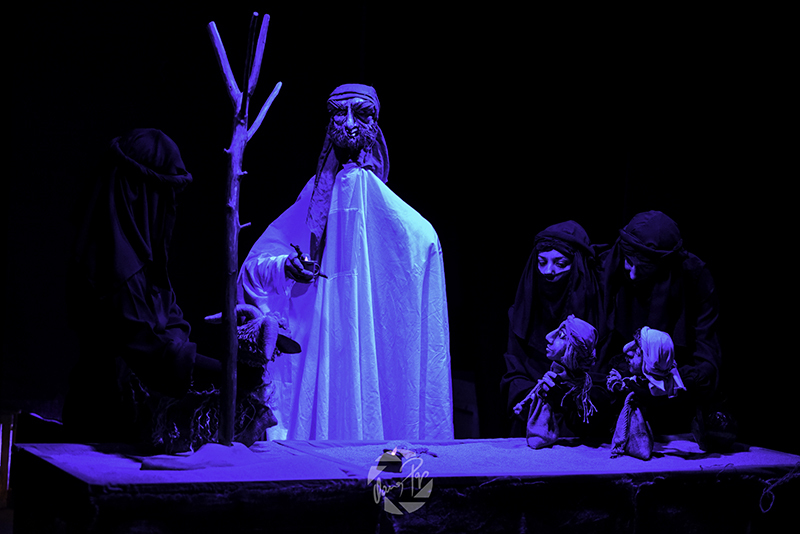 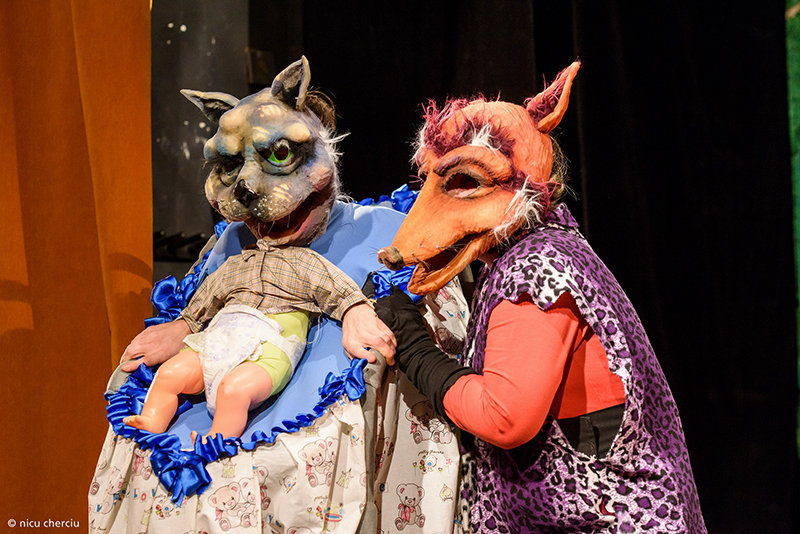 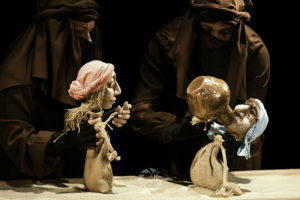 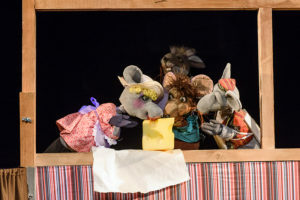 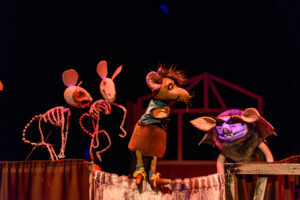 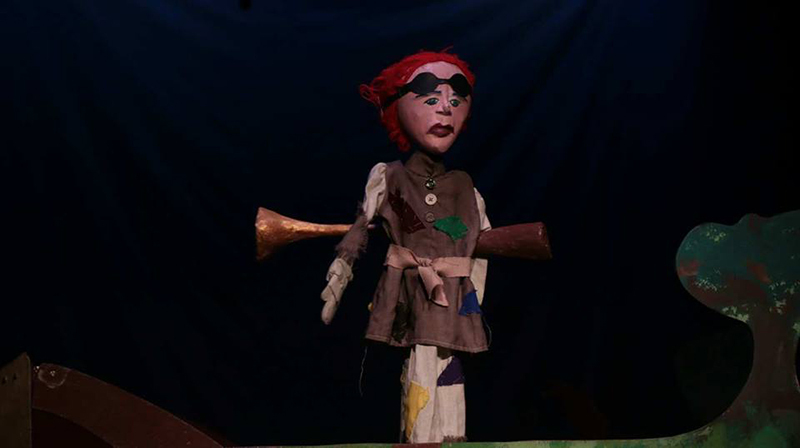 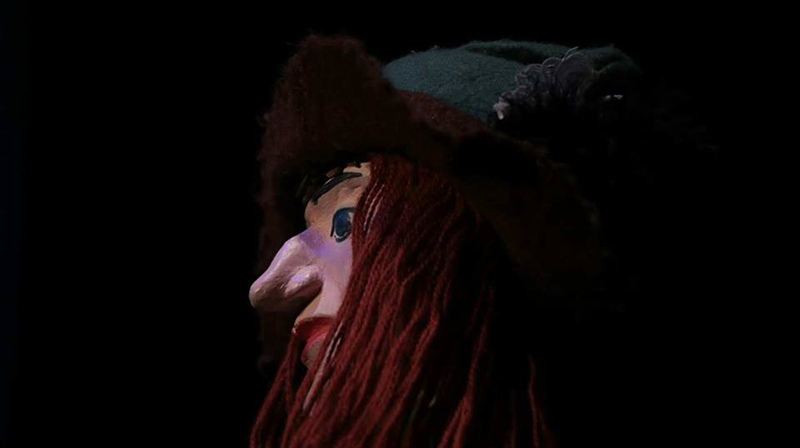 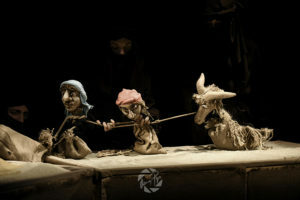 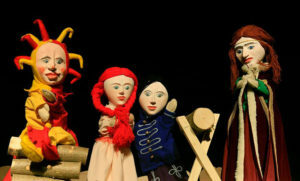 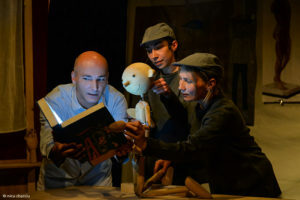 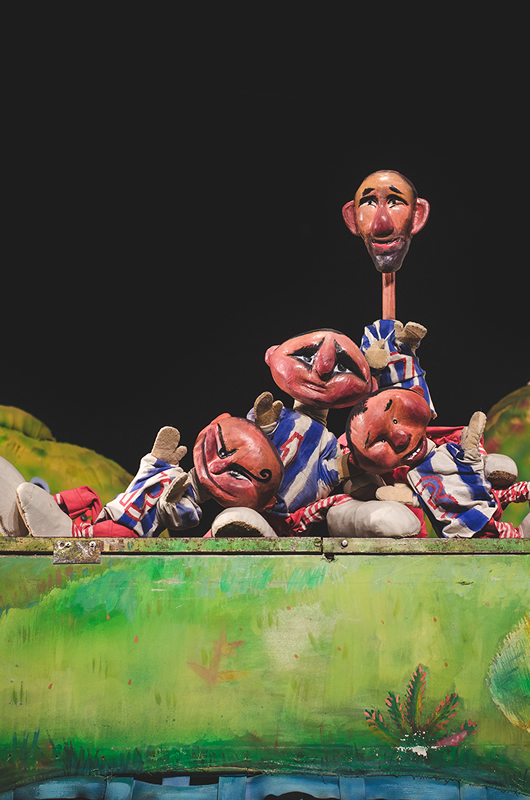 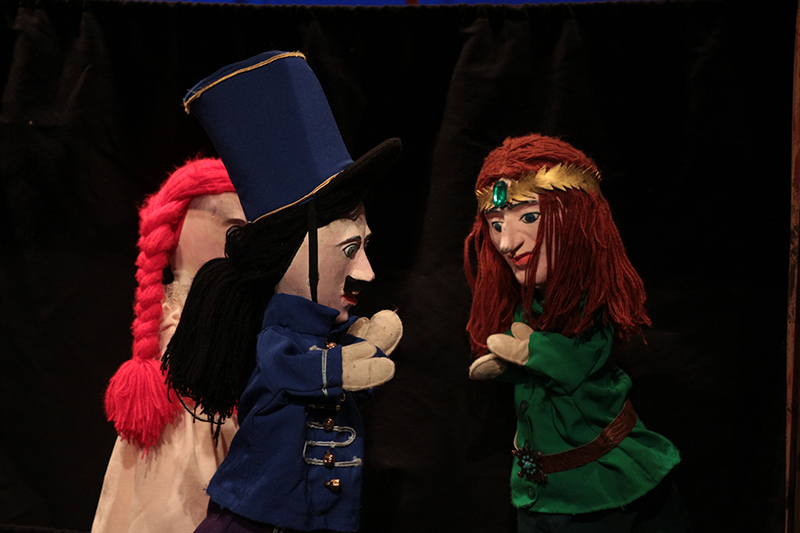 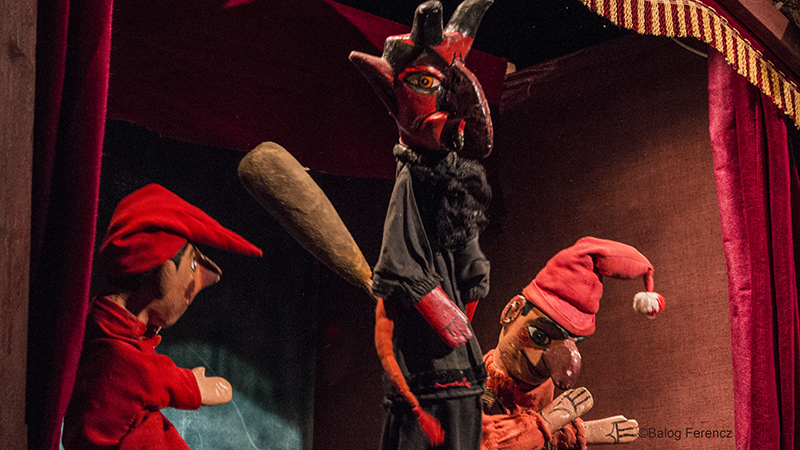 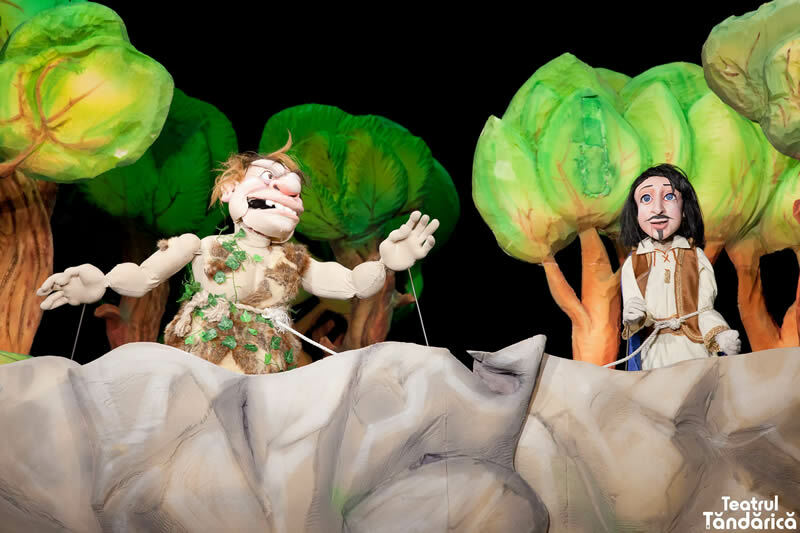 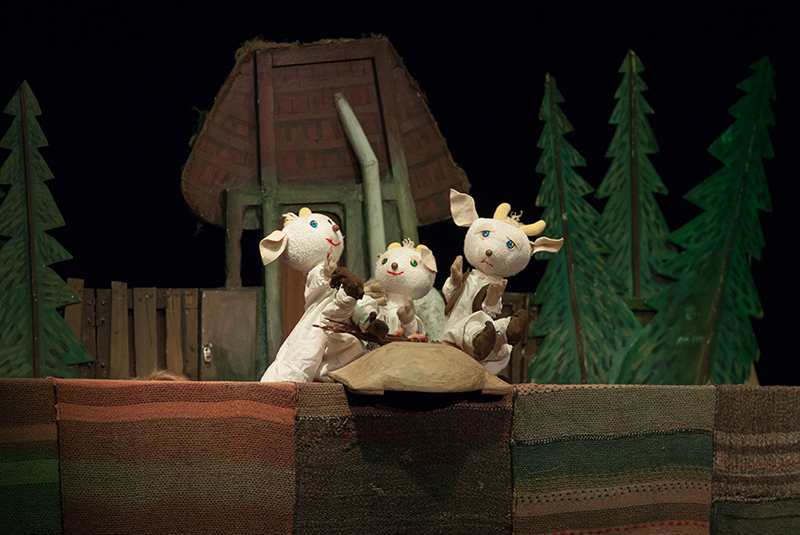 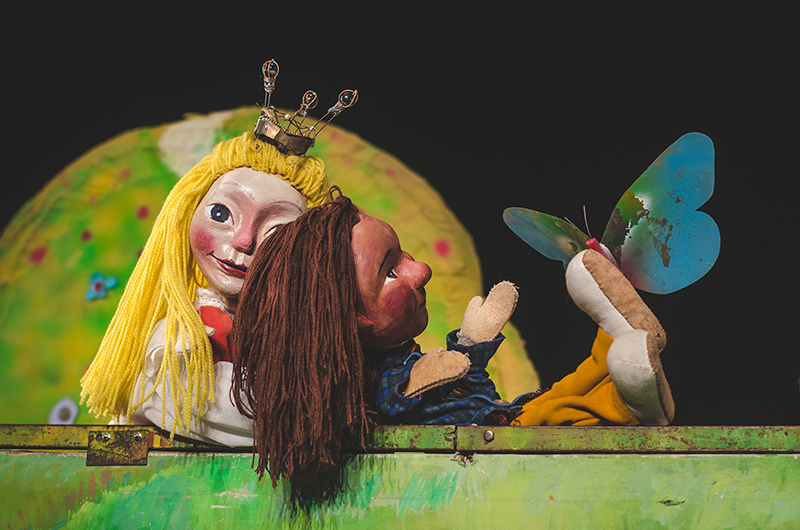 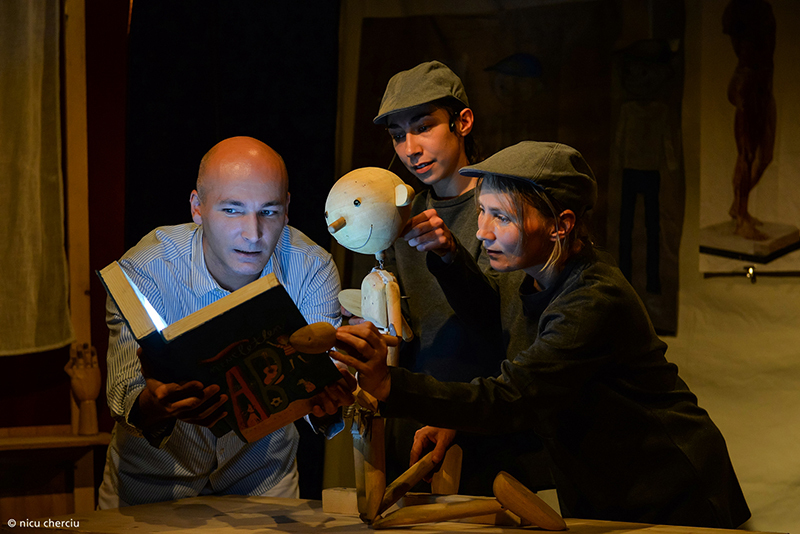 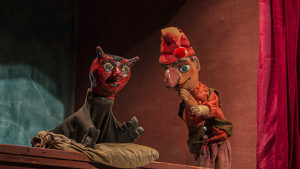 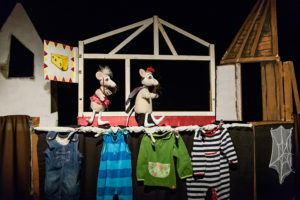 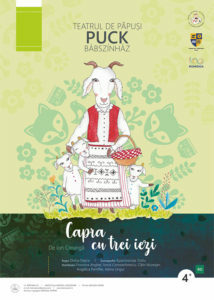 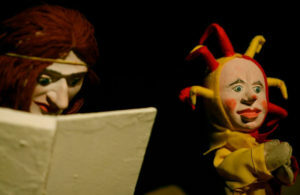 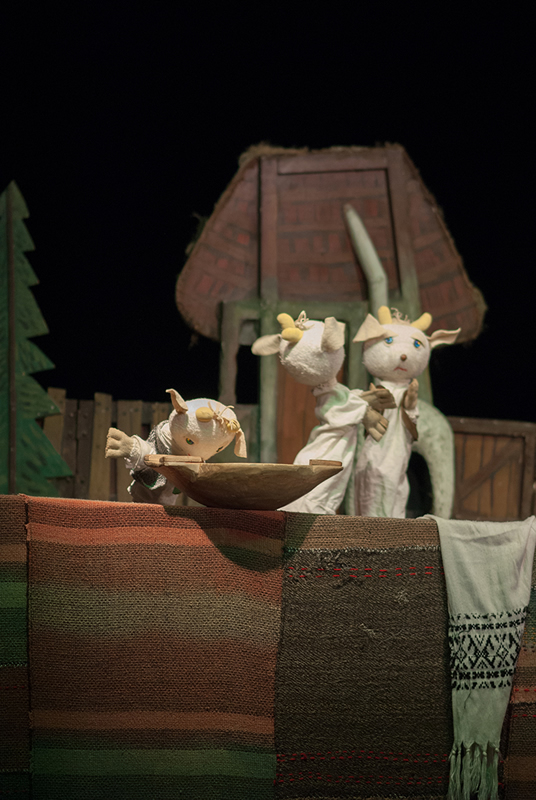 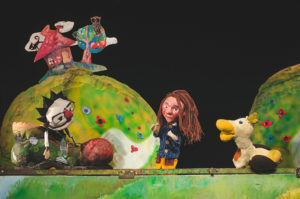 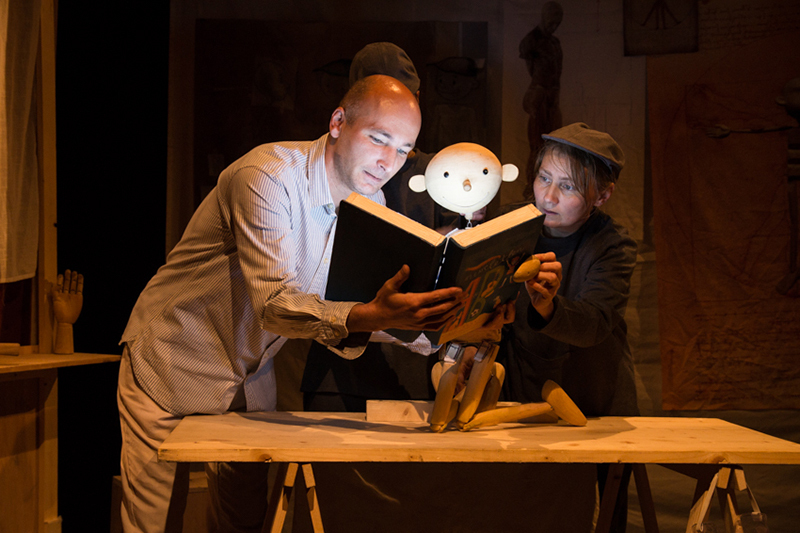 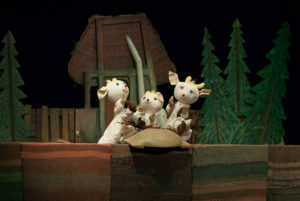 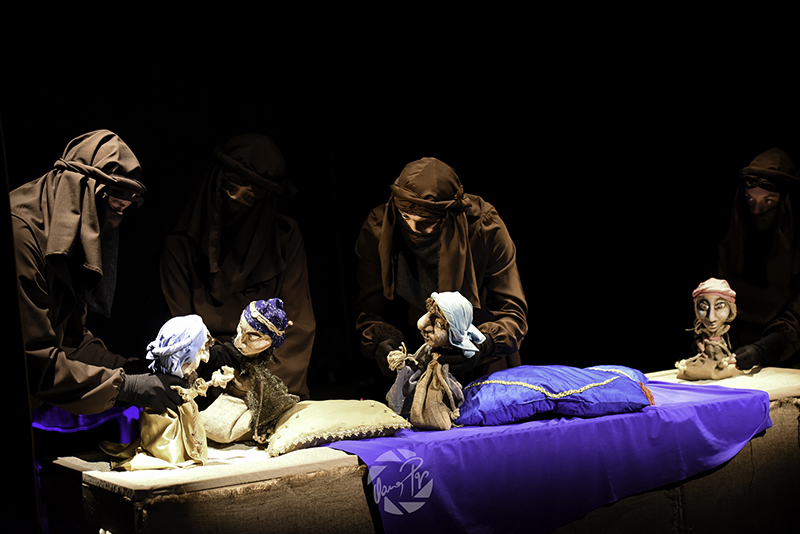 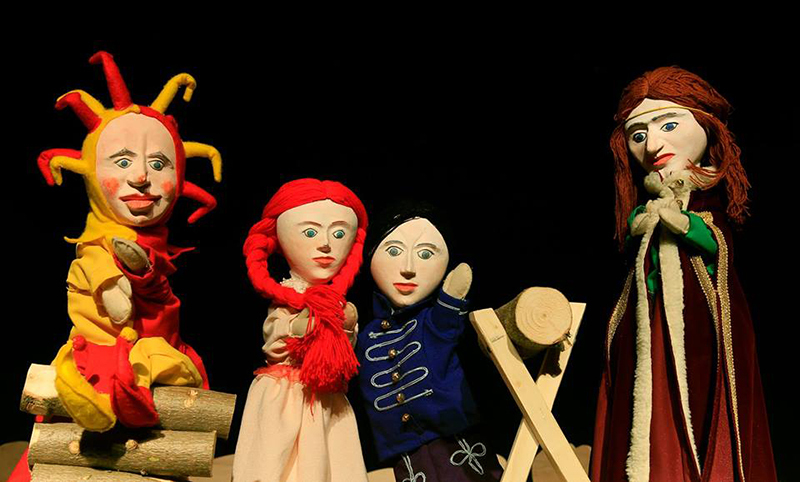 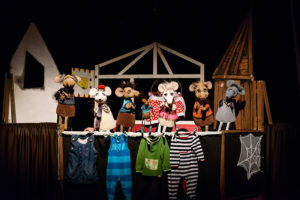 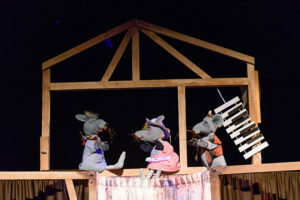 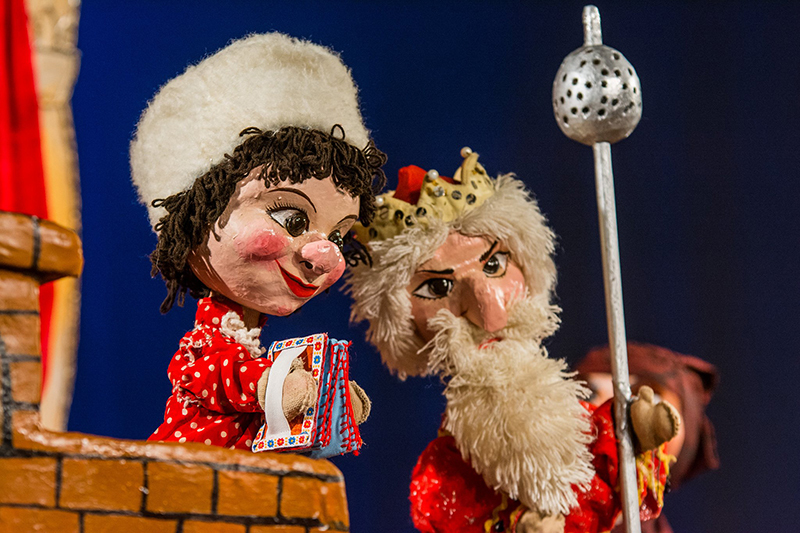 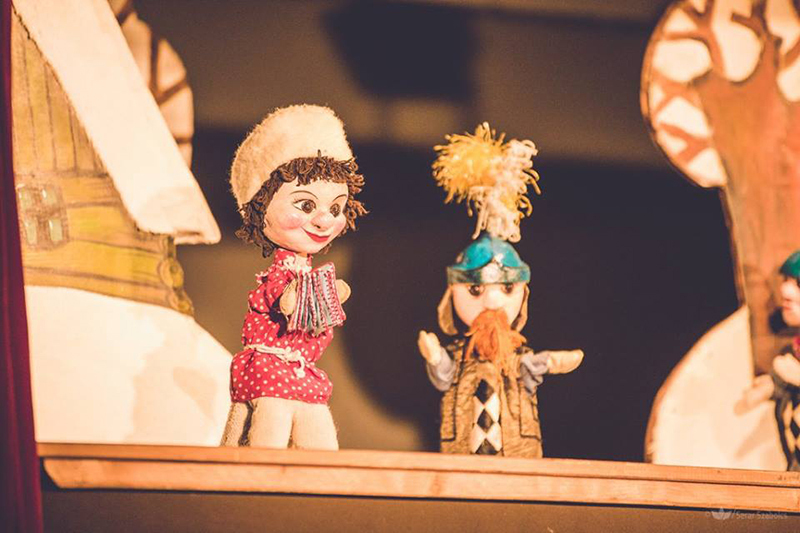 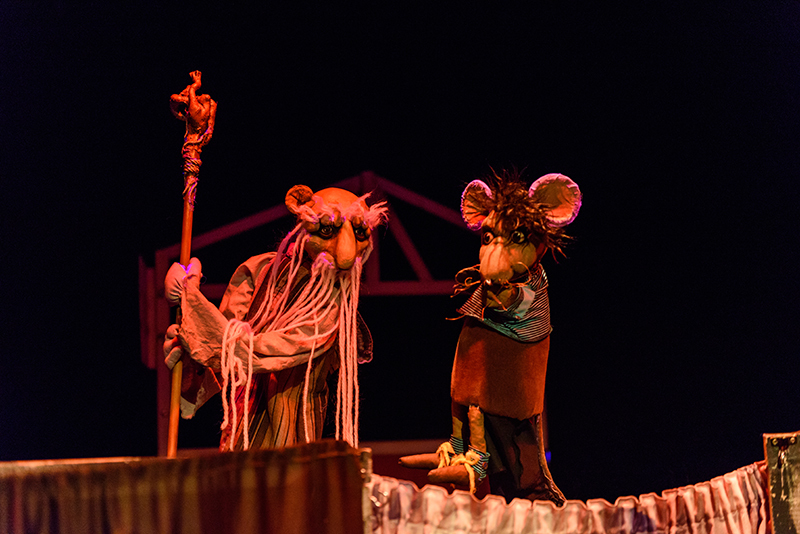 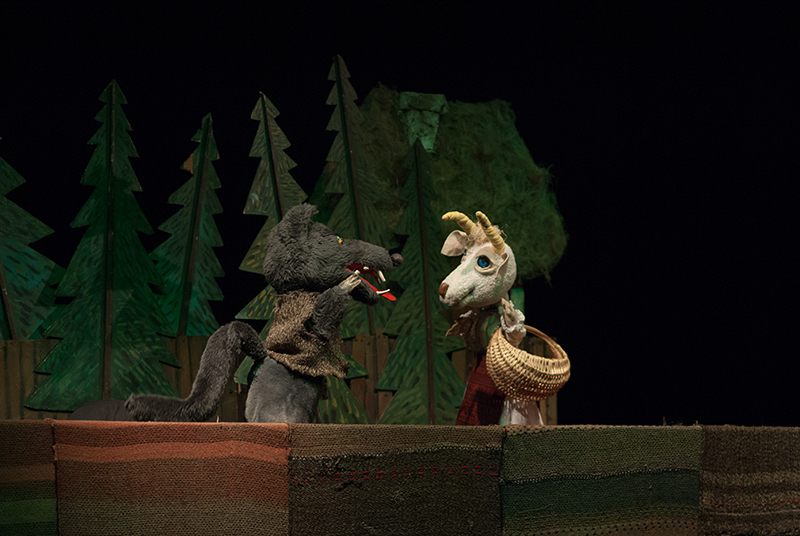 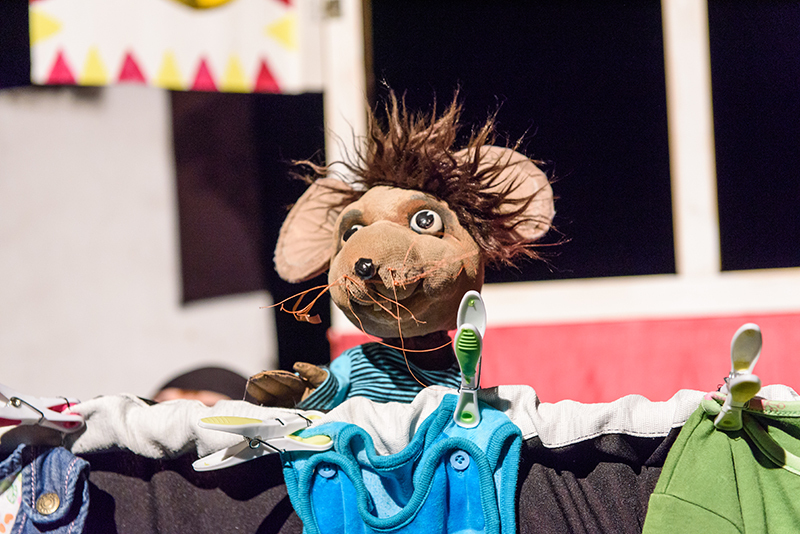 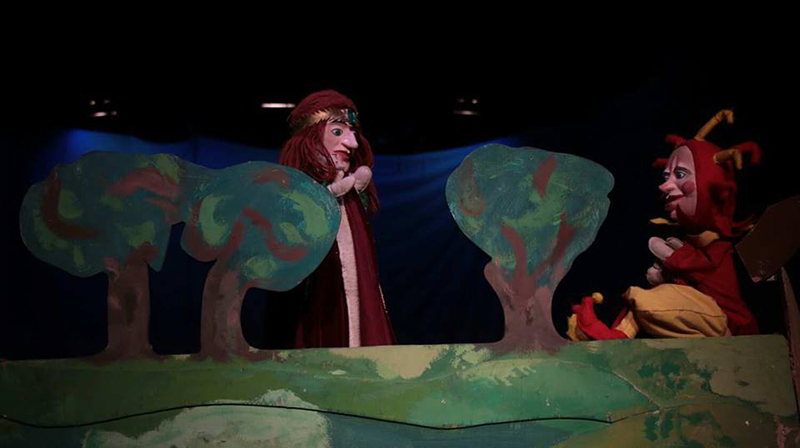 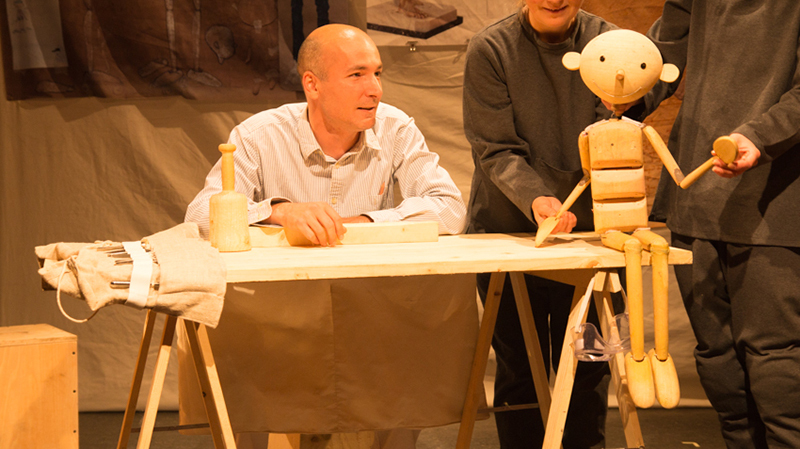 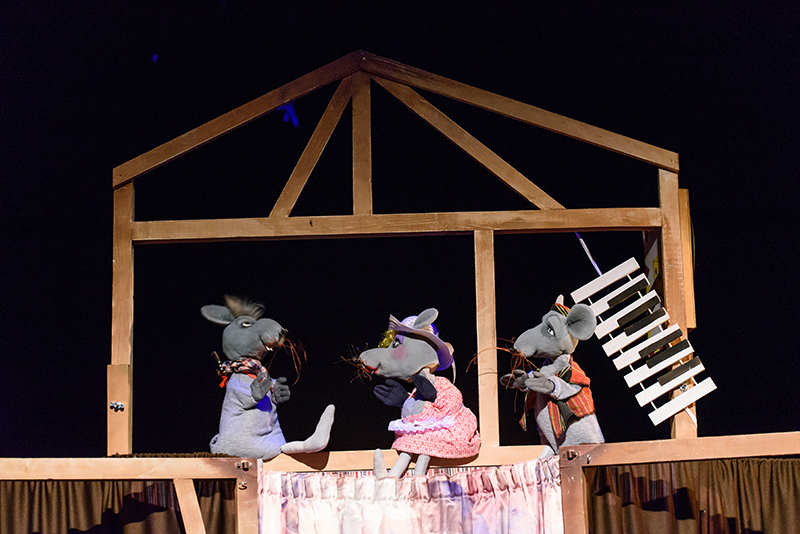 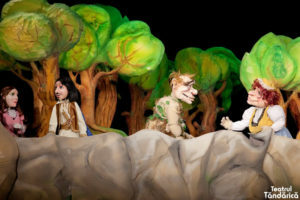 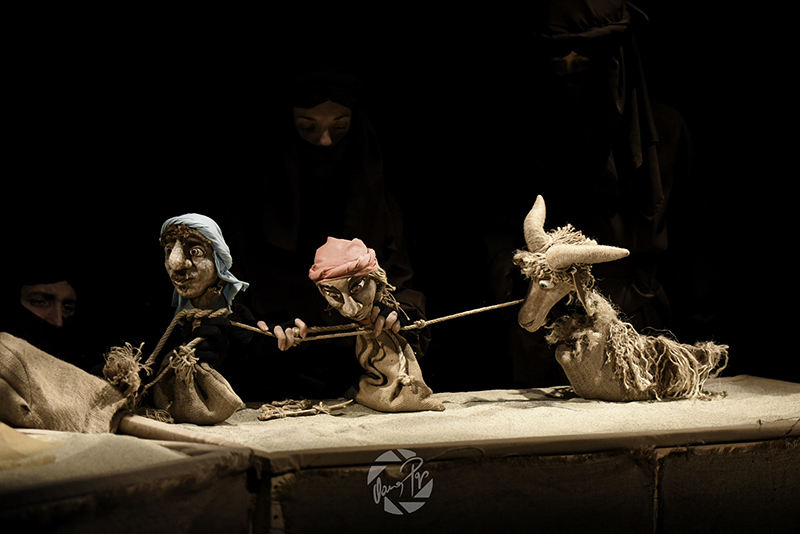 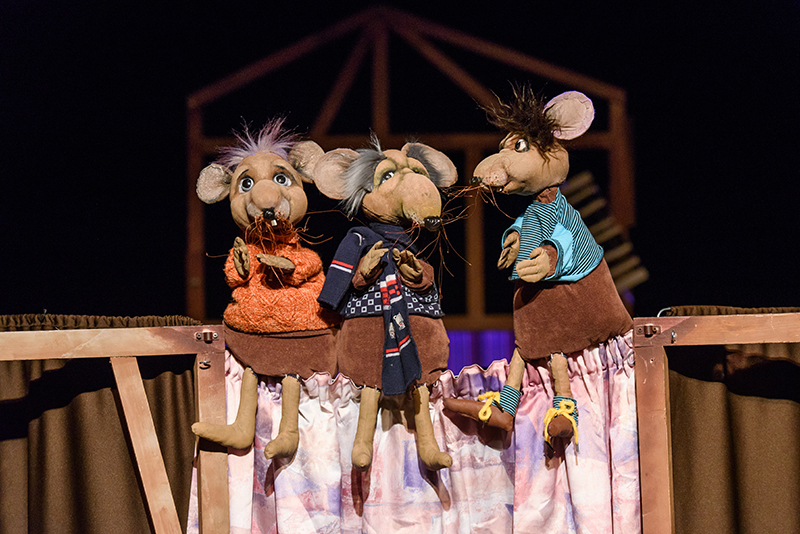 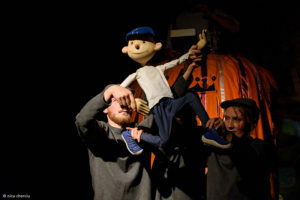 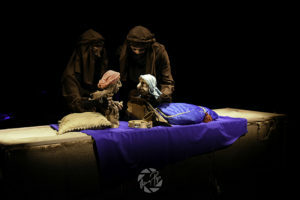 The puppet show adaptation of Ion Creangă’s tale, The Goat and Her Three Kids invokes real sentiments, real life situations and different character types in order to form an emotional and rational bond with the children. Doina Dejica’s experience of a lifetime on the puppet theatre stage, Epaminonda Tiotiu’s scenography, the bi-ba-boo puppet handling technique, the actors’ interpretations, along with the musical background, all add up to a wonderful and valuable classic representation, full of liveliness and humour. 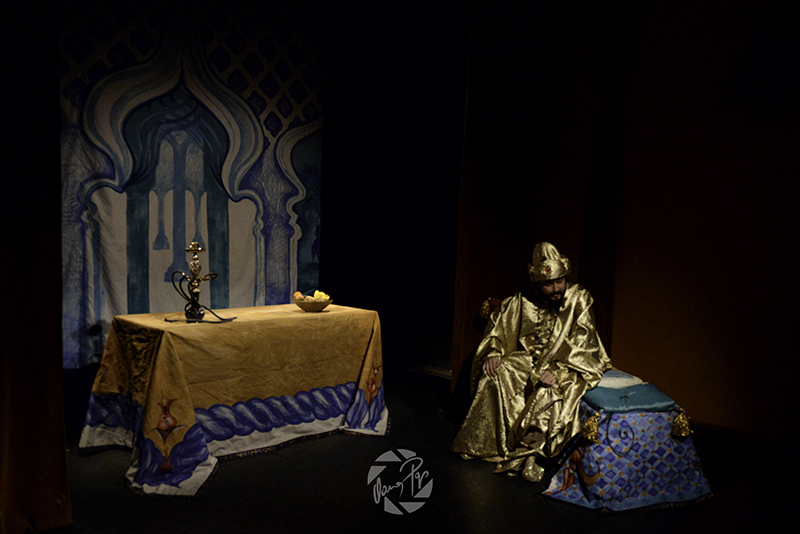 “Once upon a time, when camels had wings and snakes had humps…” – so begins the story of the wonderful Scheherazade, about Ali Baba’s adventures among the sandy desert dunes. Like in a dream, we enter an enchanted world in which caves hide unexpected treasures and true kindness and friendship always win the battle against evil. 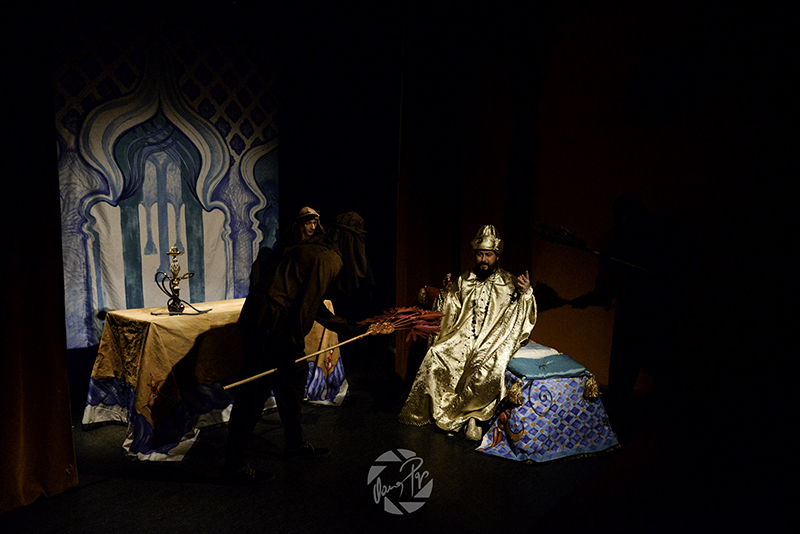 Together with his friends, the young Morgana and Behar, the ram, Ali Baba manages to defeat no less than forty thieves and his endless kindness is rewarded with countless riches. 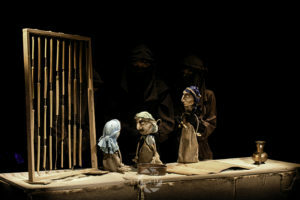 Of course, his journey is hardly an easy one, as he must face tough challenges, sandstorms and many traps that lie ahead. 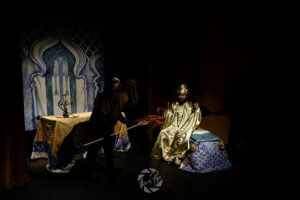 Aleodor the Emperor, adapted and directed by Decebal Marin, maintains the general outline of the classic tale written by Petre Ispirescu. 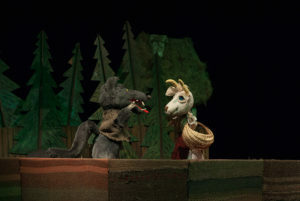 After the death of his father, Prince Aleodor disregards his advice not to enter the realm of the Half-Man-Riding-on-the-Half-of-a-Lame-Rabbit and embarks on a journey in search of Emperor Verdeș’s daughter. On his way though, he has to face several challenges in order to win the hand of the young princess in marriage. 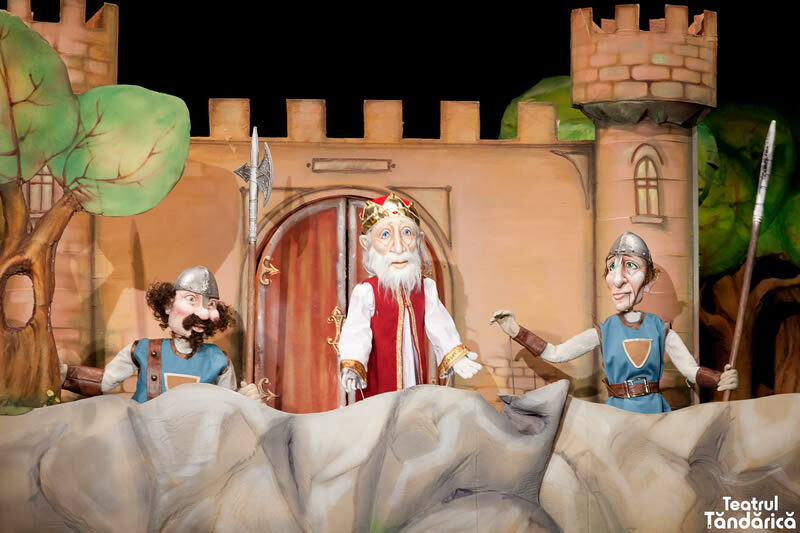 After the death of king Matthias, several stories have spread about the country’s leader, also known as King Matthias the Just, for his wisdom and sense of justice. His exceptional character, his leadership skills and competence have been respected and remembered across the entire empire. This play is the fusion of four tales: in only one day we can witness the siege of the Szabács fortress, from Tibrilit, Matthias’ jester we find out what we have most in this world, we meet the Huszár who’s in search of love and in the end, with the help of the children, we defeat the ruthless Judge too. 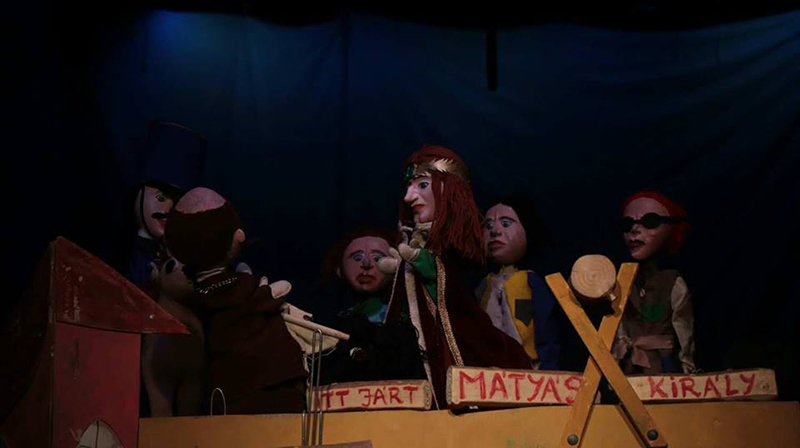 At the Behest of the Pike is one of the best known Russian folk tales, the protagonist of which, Emelya the fearless is very much alike our Erős János (a Hungarian folk tale hero), since both are ready to leave behind the warmth of the stove and the comforting idleness when the moment comes, just to prove: he’s not from this world and knows no impossibilities. By following the Pike’s magic words, Emelya dresses her mother in exquisite furs, treats the forest animals, transforms the Russian winter into spring, makes the Neversmiling tzar princess laugh, then takes his happy bride back to his fancy forest cottage. 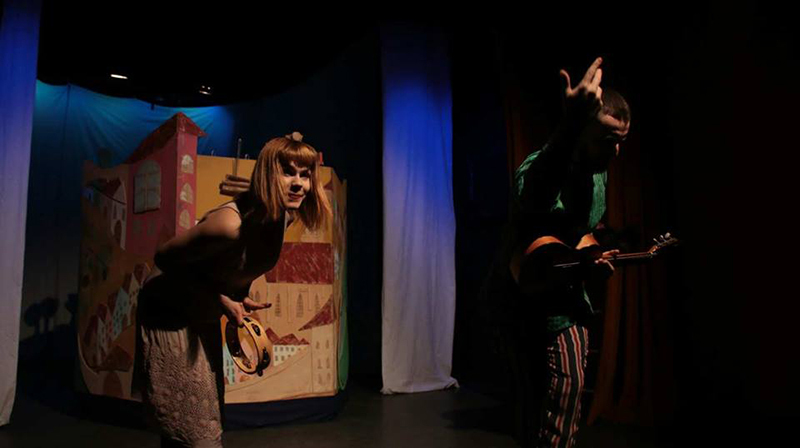 He achieves all these playfully and effortlessly, while playing a tango harmonica – his spirits are never cast down by difficulties. 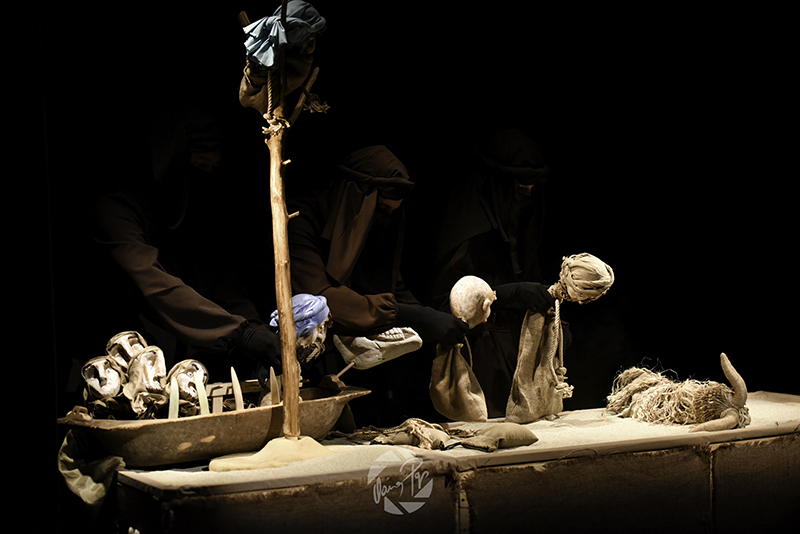 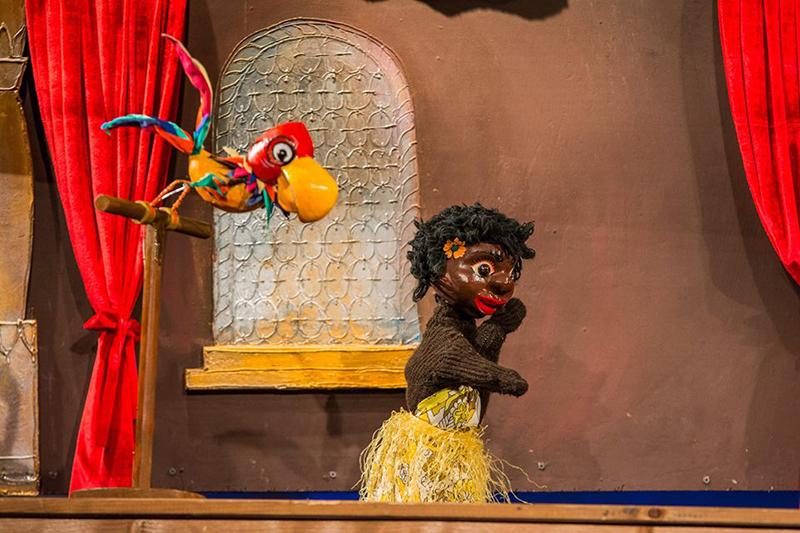 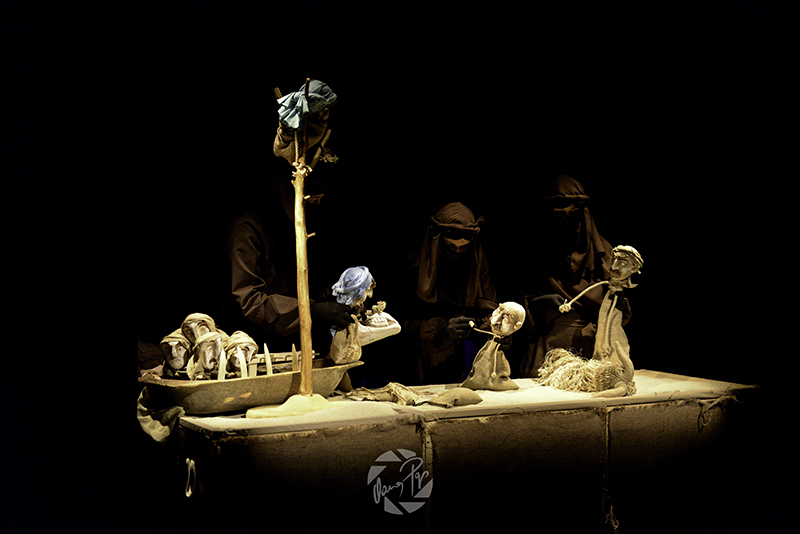 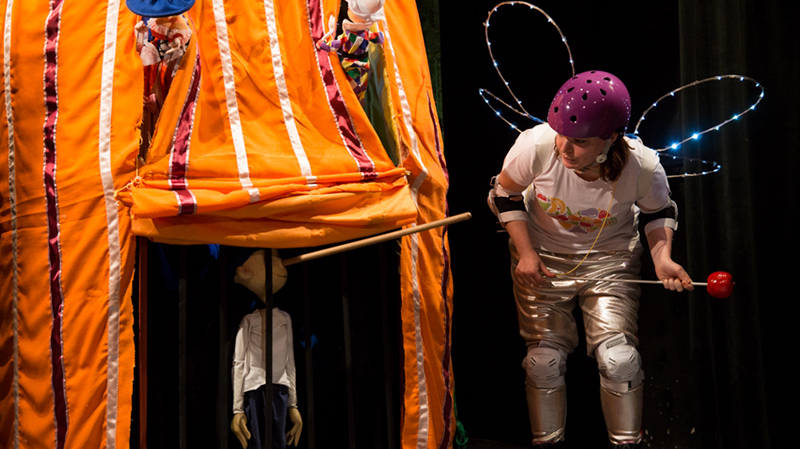 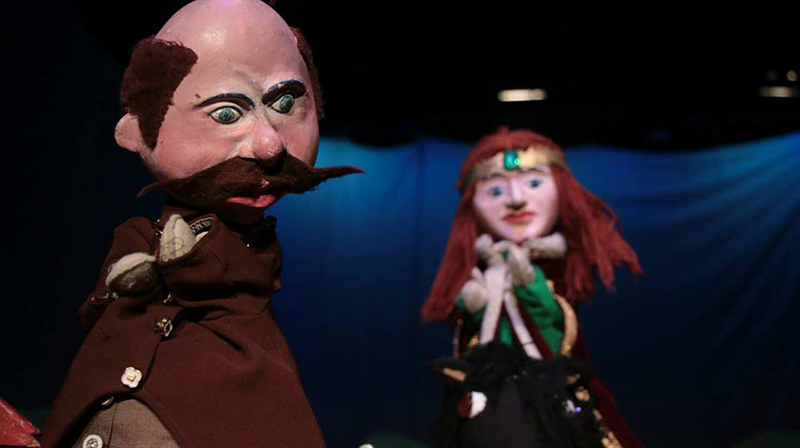 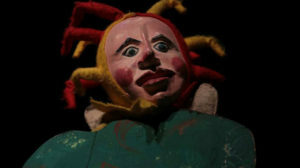 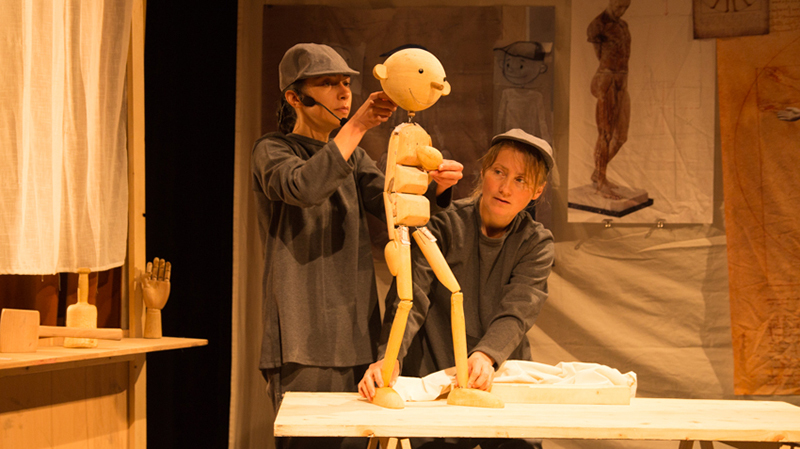 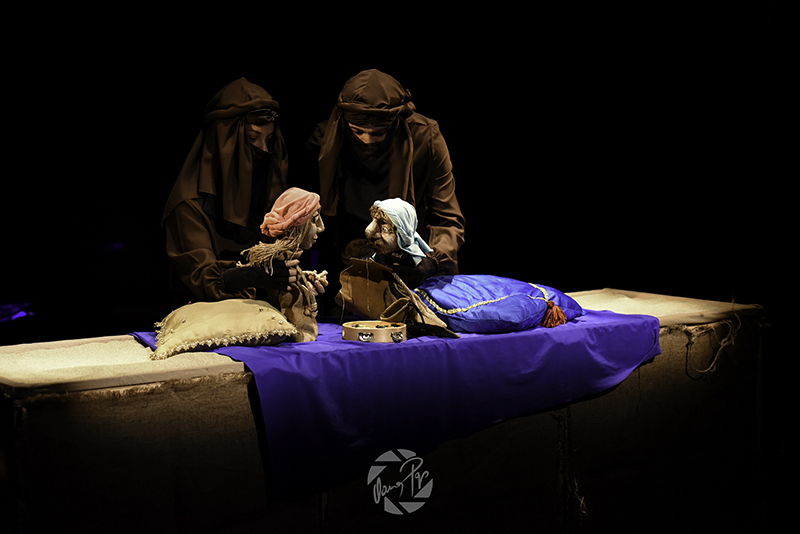 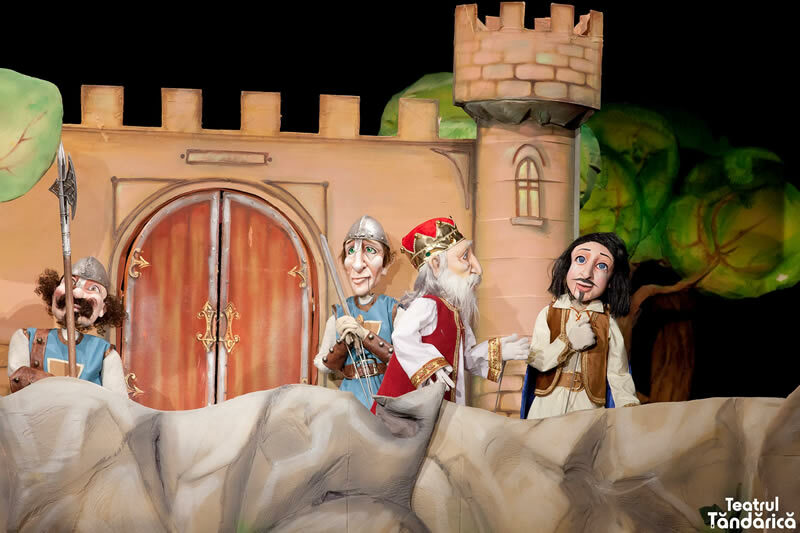 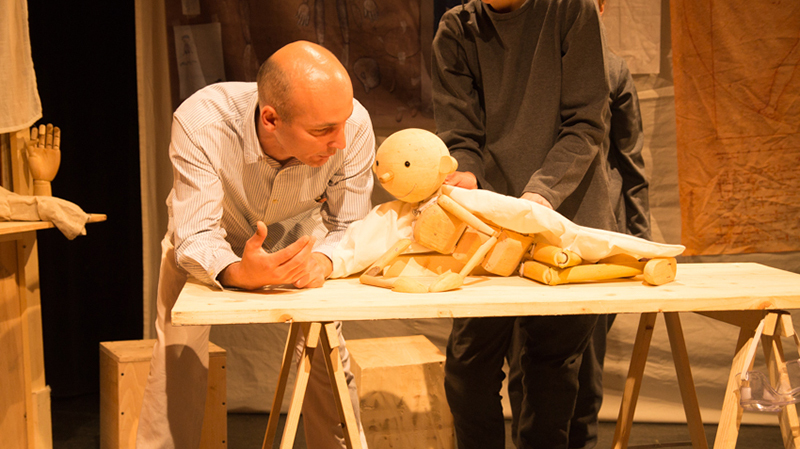 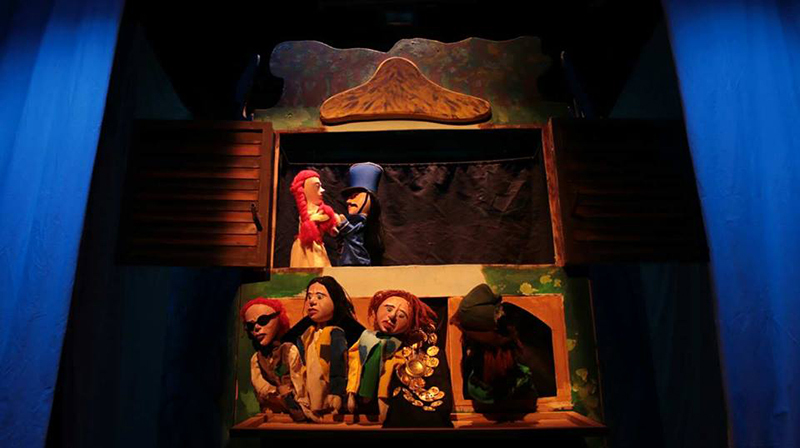 Our play is a classic puppet show, a perfect example for the conventional storytelling with puppets, in which the fundamental message of the tale, the purity of the narrative and the precise construction of characters are essential. 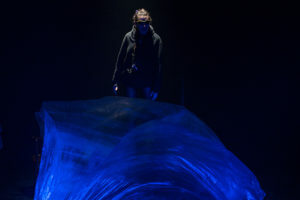 The renewed play brings an homage to its creators: Balló Zoltán, director, actor and Wallner Günter, sculptor, scenographer who created the show in 1987 ̶ points out Varga Ibolya, the artistic director of the show. 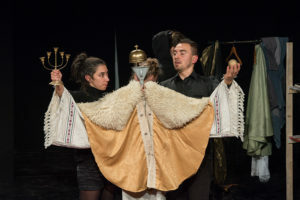 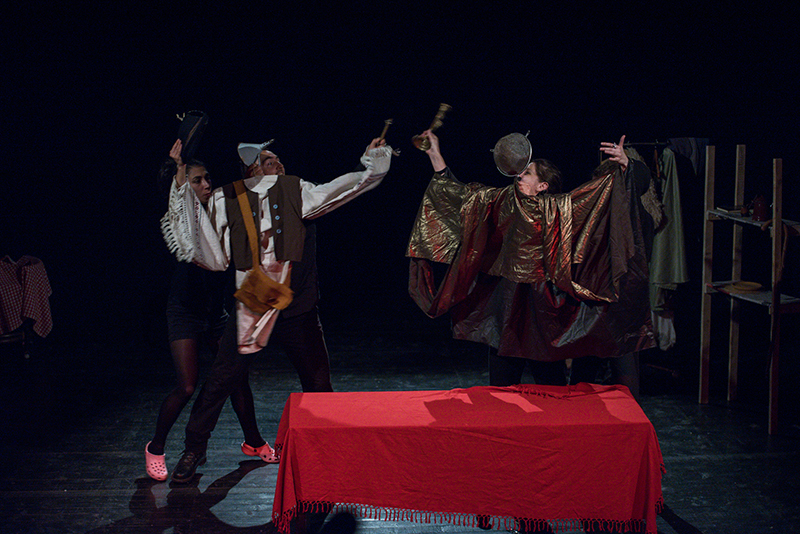 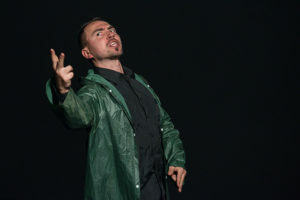 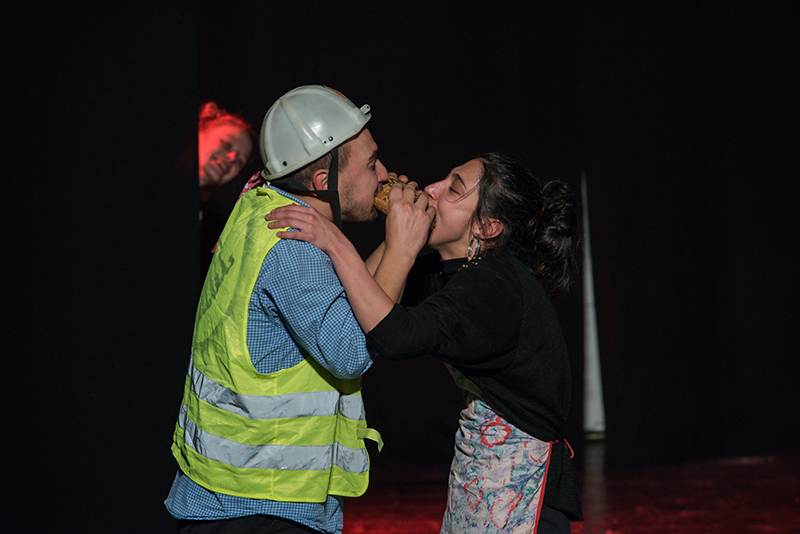 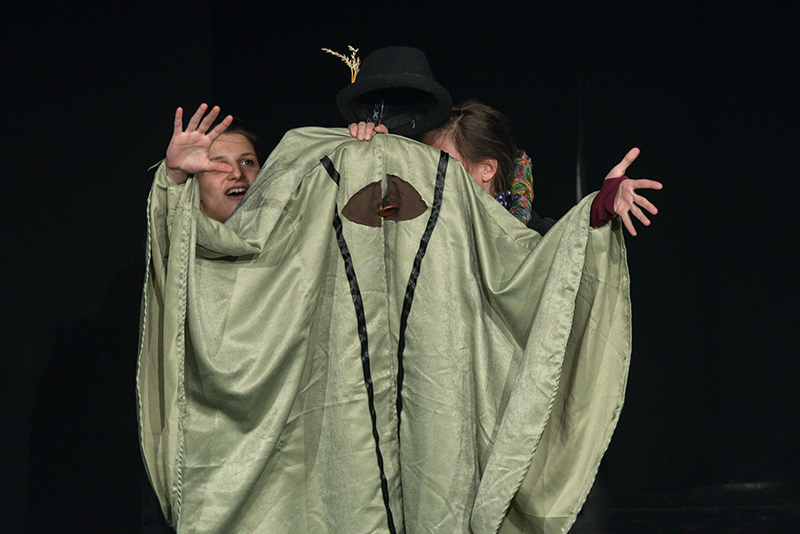 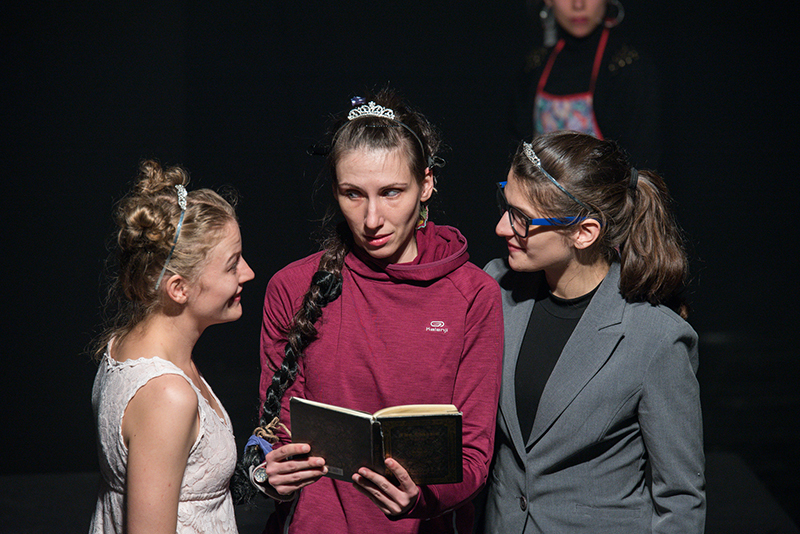 The play adapted and directed by Călin Mocanu deviates at some points from the classic tale. 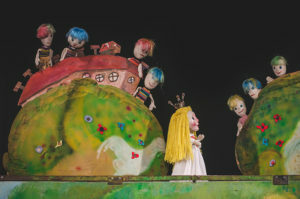 The Fairy, having significant role in the play, is in fact a representation of a withdrawn mother, who is always there in times of trouble. Instead of poor old Gepetto, in this version we can see a renowned artist, whose masterpiece is Pinocchio himself, whom, in his turn – like all masterpieces – comes to life and starts living his own life. 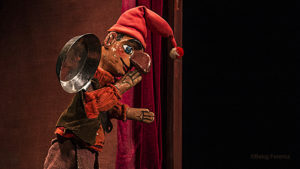 After some time, Pinocchio freely calls Gepetto his father. 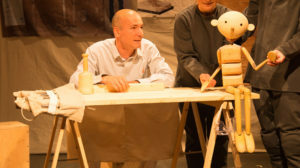 This is not only the wonderful story of awakening to consciousness and coming to senses, but also introduces an aspect of independence, when a young life steps out from a sheltering and loving environment, starts testing his limits, while he also keeps learning about himself and discovering his place in this world. 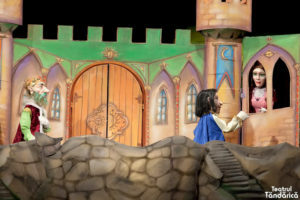 “In a country where parents have low self-esteem, who are rather commanding than actively participating in the educational process of their children, we see a child in constant need of attention for whom we must increase our amount of designated time and awareness, whom we must carefully listen to (instead of just telling for ourselves) to truly understand his heartbeats. 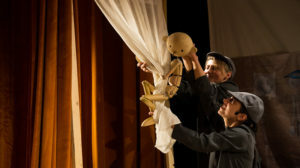 Seeing how our lives go by, how busy we all are, the options our schools, educational system and culture have to offer, the story I’m trying to tell has no aggression in it, I’m merely indicating the conflicts and the dangers that the child is facing” – acknowledges the director of the show. 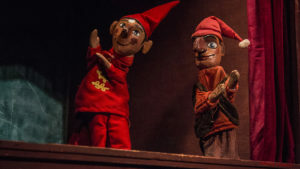 The birth and transformation of Pinocchio is a miracle in itself, his adventures represent the symbolic journey of the development of a mature, mindful and responsible personality. The three daughters of the emperor wake up in a dark room in an unknown place. Someone must have sent a dense slumber-breeze over them and – hang on! – kidnapped them. The three princesses soon discover that they are imprisoned with the Yummy Mummy, who is confident that his knight will soon save her from captivity. 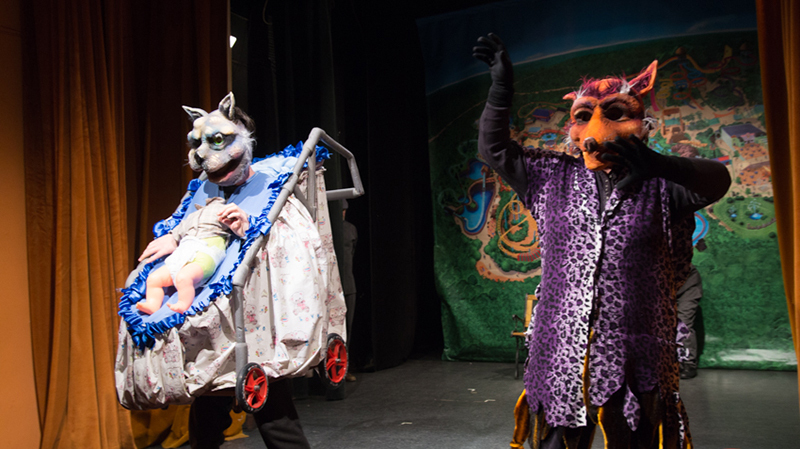 You must have guessed by now that the kidnapper is no other than the dragon. 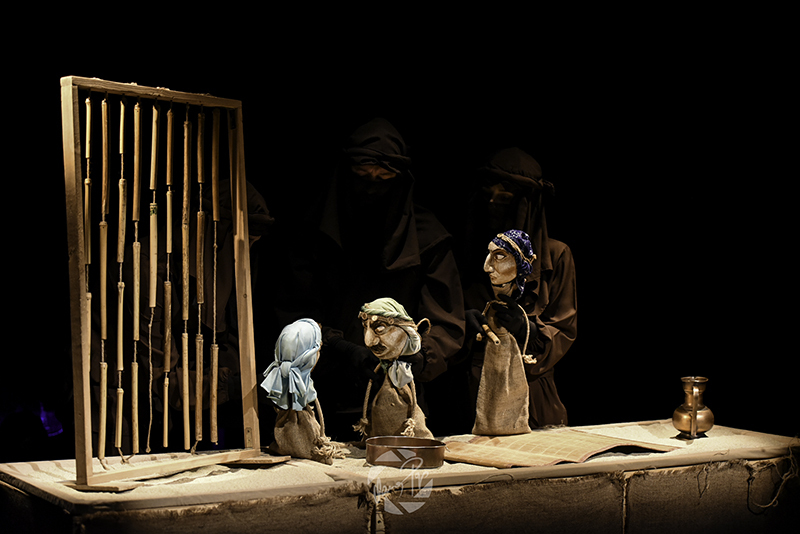 So the girls deploy all their forces, knowledge and intuition to find the key of salvation. 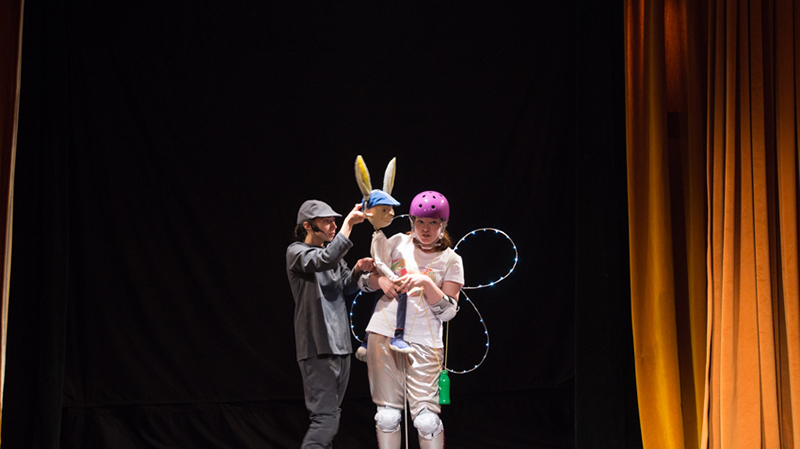 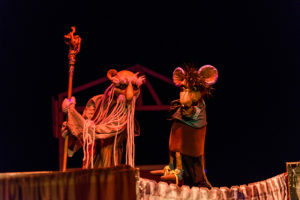 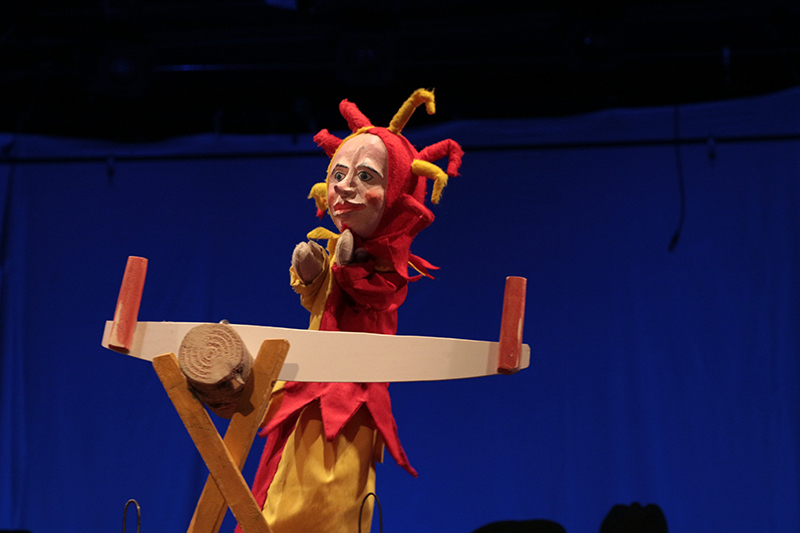 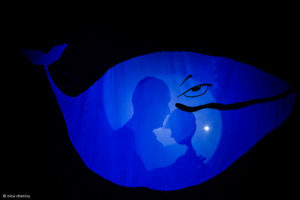 The performance, which includes a wide range of puppetry techniques, is based on the tales written with brilliant imagination by 3-7th graders for the fairy tale writing contest entitled Heroes and heroines. 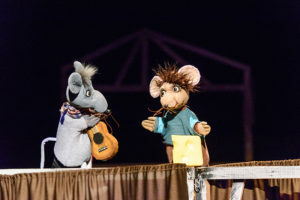 In the world of mice, just like in ours, courage has a vital role, but at the same time fear itself is just as important, for the ones who are irresponsibly daring or reckless can easily get into trouble. 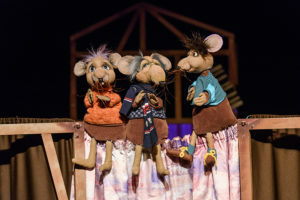 “A mouse cannot be fearless” – is often told to Elemér, the Skinny Field Mouse, the protagonist of the story, who distinguishes himself from other mice by his bravery complemented with wit and resourcefulness. His reward will be no less than princess Cincinella, the daughter of Louis Albino the XIIIth. 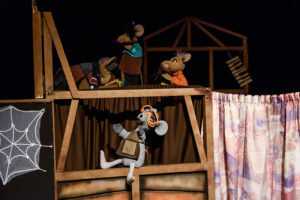 The path leading to her, however, is adventurous and perilous, because first he has to fight the Hairy Flittermouse, has to win Sir Marten the Grey’s trust and has to trick Mutsifer and Cutsifer. 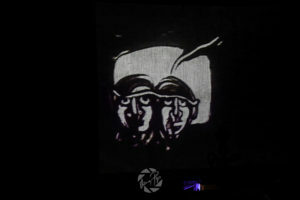 The responsibility taken for others makes you mindful and reveals your own limits. 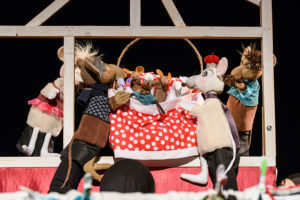 Elemér, the Skinny Field Mouse recognizes fear only when his loved one gets into trouble, but his courage will become exemplary to the residents of the Attic. 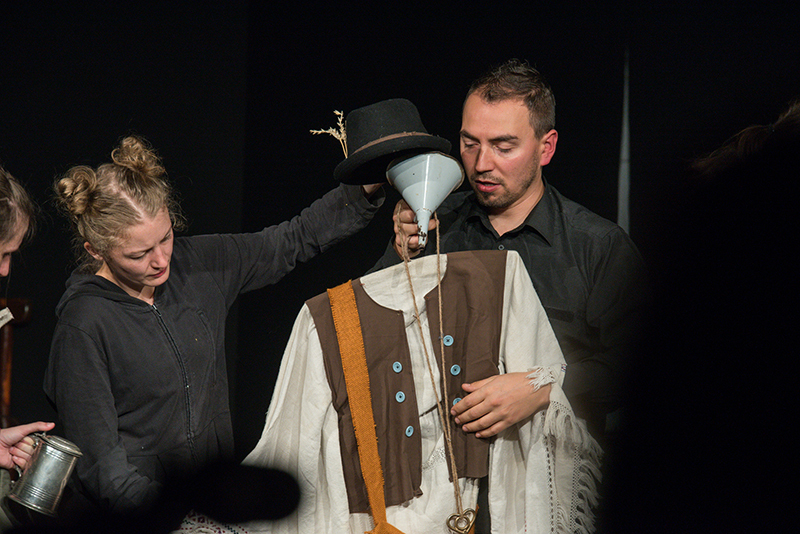 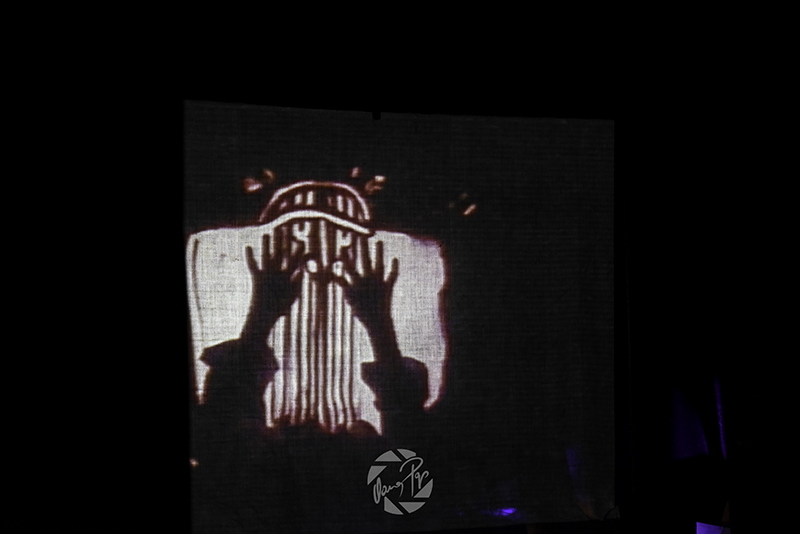 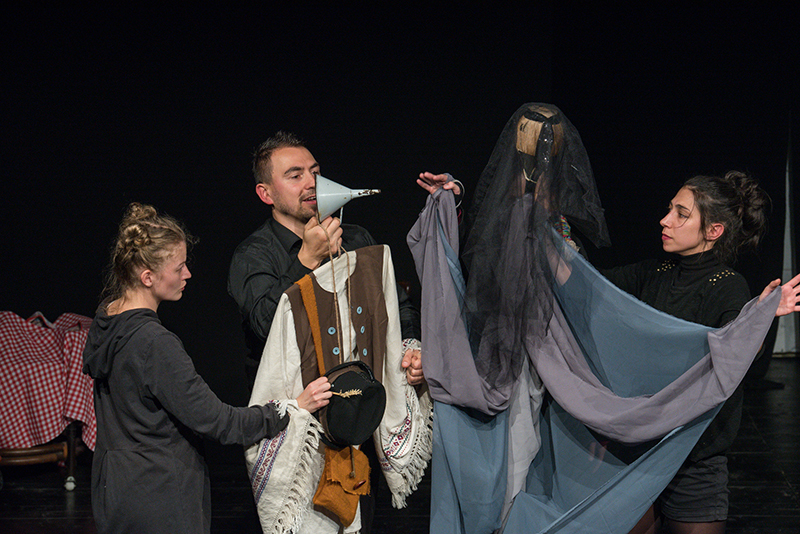 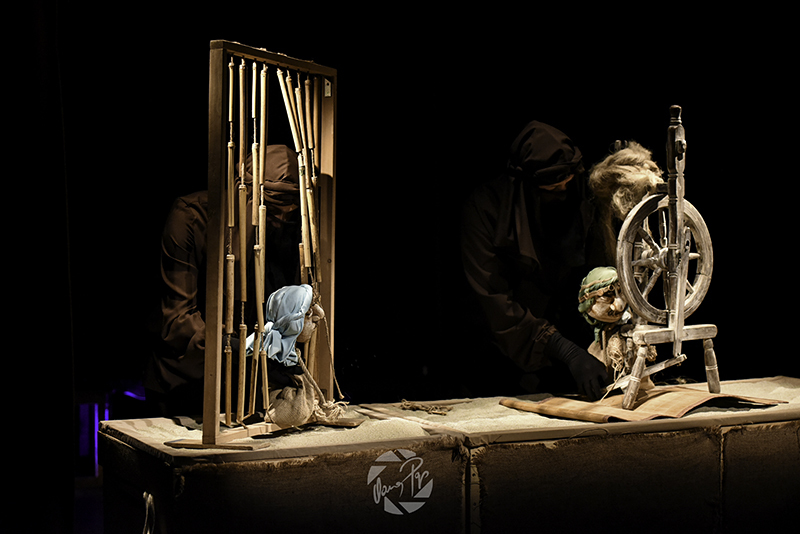 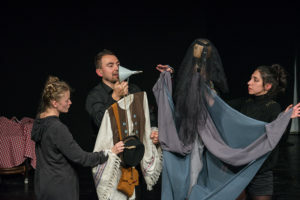 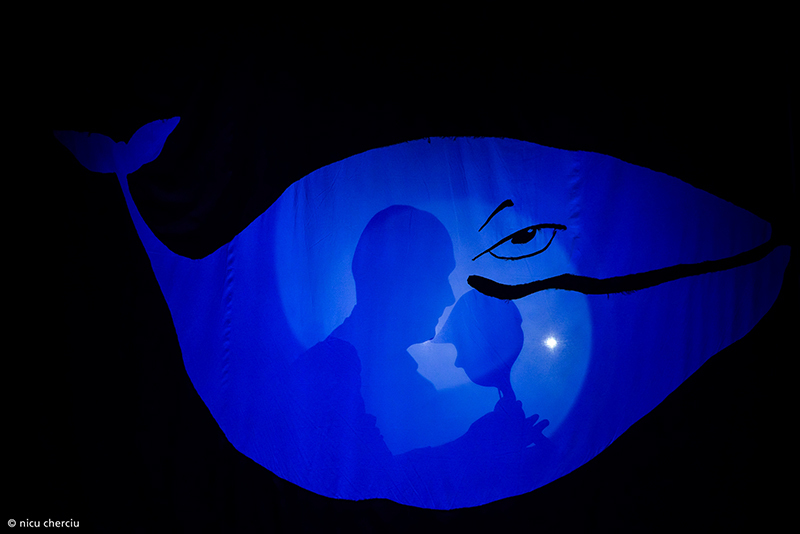 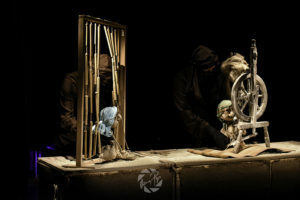 “A glove puppetry performance can be highly challenging even for experimented puppeteers: several characters and accessories, playing with both hands and the unconventional height of the puppet stage make the task a lot more difficult” – claims the director of the show, but he trusts in the actors and hopes that the audience will receive the play with delight. 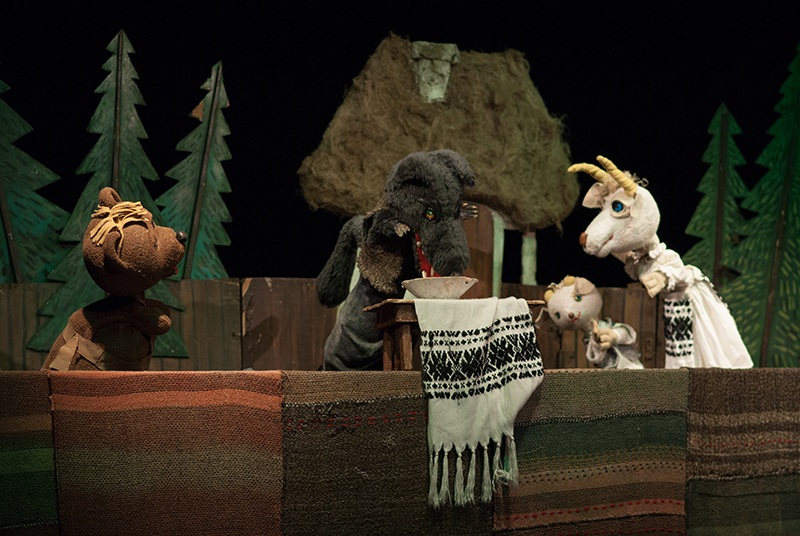 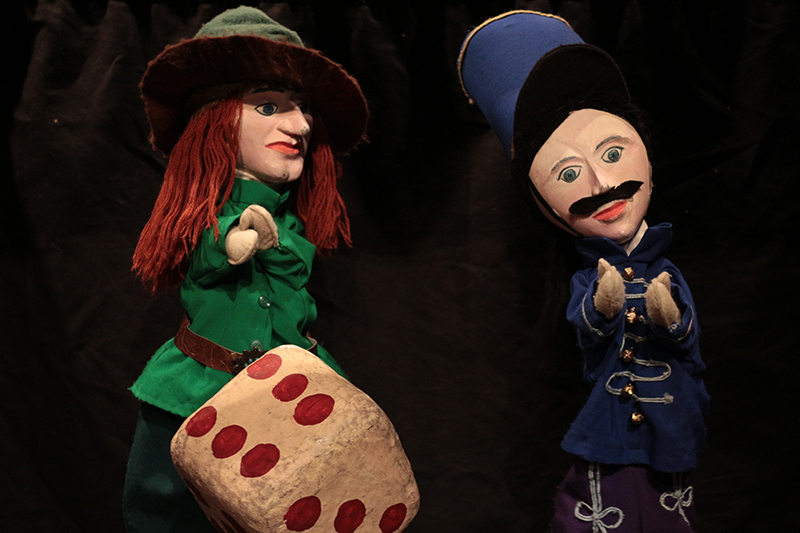 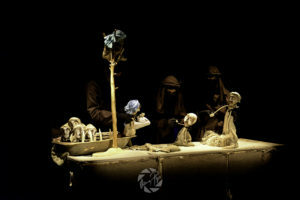 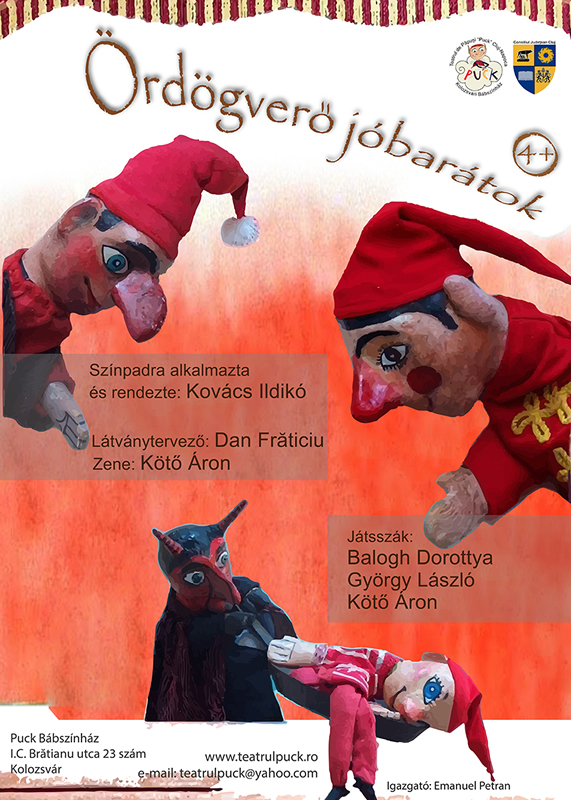 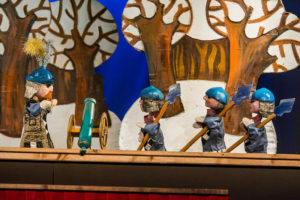 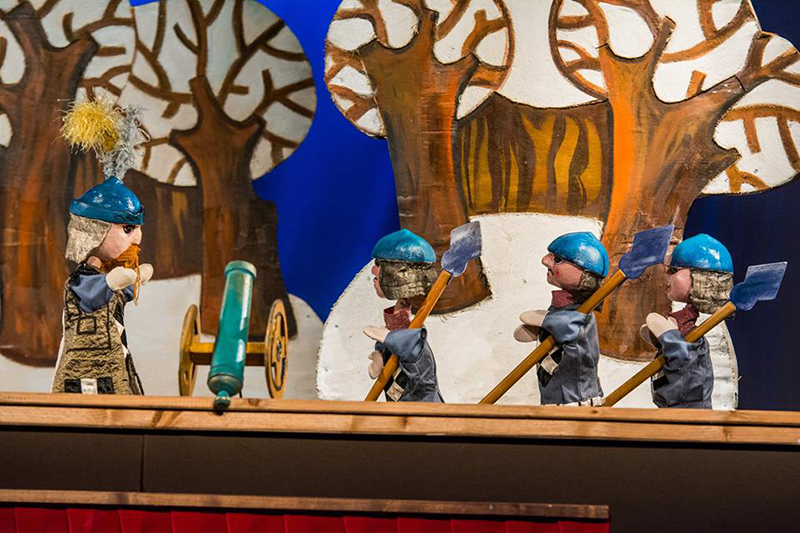 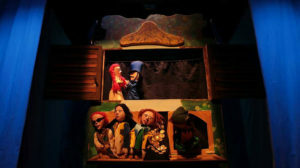 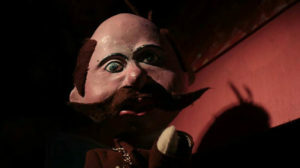 A puppet show adaptation of Ervin Lázár’s tale about true love, responsibility, loyalty, perseverance, freedom and many other fundamental values. In spite of the malicious trickeries and fiendish seductions of the Witch of a Hundred Faces, Poor Johnny finally gets to know his true love, Árnika, king Östör’s beautiful daughter. 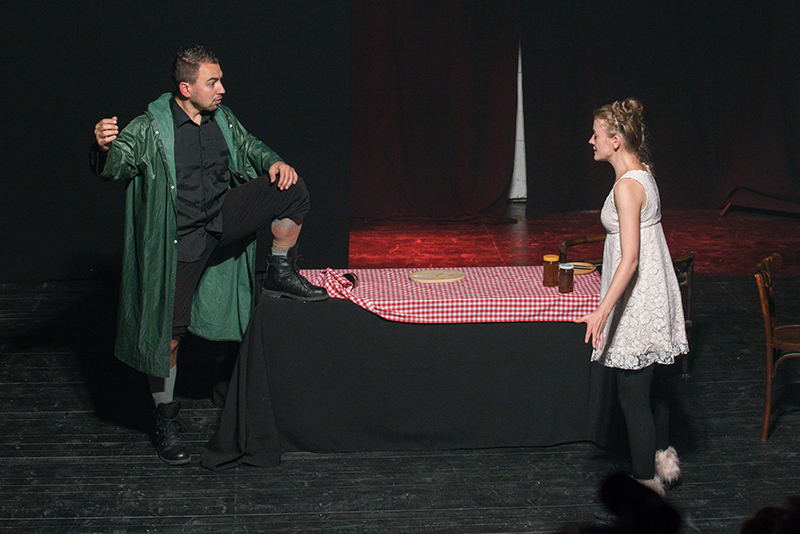 The protective love of the father puts the young lovers’ loyalty to test, by keeping them apart for six months. 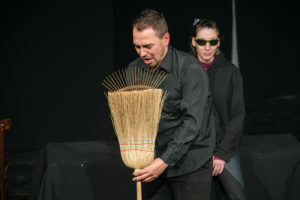 Even after all that time, however, their trial has not yet come to an end, because alternately one of them is transformed into a duck by an evil spell. The remedy for the curse lies in Wonderland, with the Seven Headed Fairy, but on their journey there, the young couple must deal with Ipiapacs bandit and his gang, Győző Rézbányai’s touchiness and the feelings of twelve brothers. 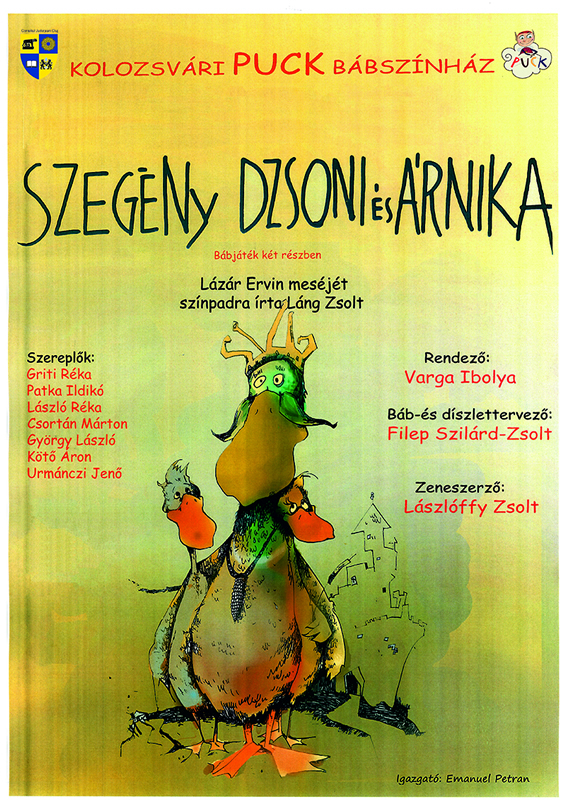 Johnny’s wit and resourcefulness, Árnika’s good heart and determination always aids them in times of trouble, until the Seven Headed Fairy finally lifts the evil curse. Two narrators also shape the play, they are the ones who keep asking relevant questions as the story progresses and sometimes give thought-provoking responses. 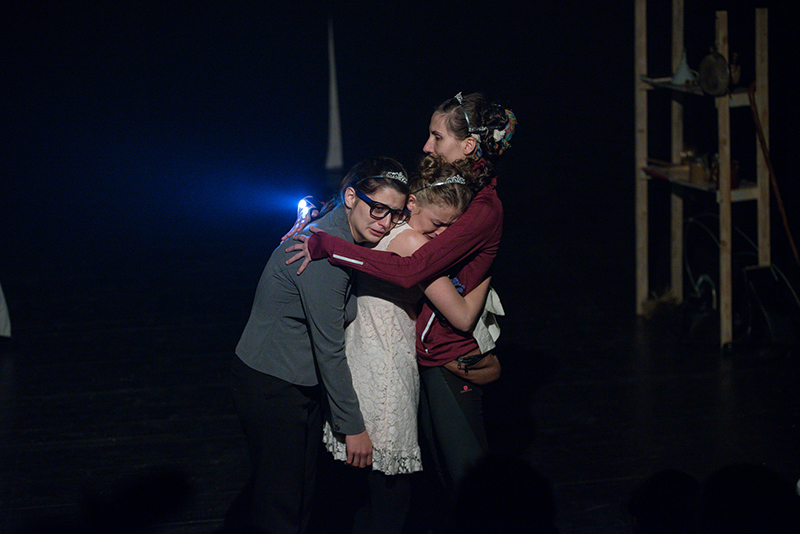 They are the ones who say: “You don’t need magic powers to gain freedom, all you need is love. 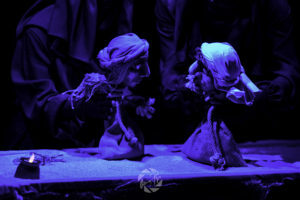 For love is just like magic.”, or “You must try really hard. 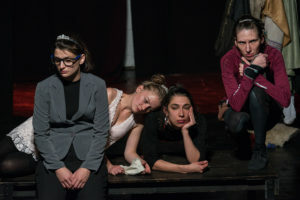 Even if you won’t succeed for sure.” – if you haven’t seen this play yet, now you sure want to, right? 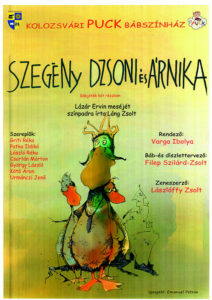 Johnny, Árnika and the others are waiting for you!